One of our top travel tips for South America is to get travel insurance. It may seem expensive, but if something goes wrong you can end up with massive debt if you’re not insured. We always insure ourselves before any trip – even if it’s just for a few days. During our time in Buenos Aires, Natalia became relatively unwell and we had to spend 2 days in the hospital. We had to cover costs of almost £1,500. Thankfully we had travel insurance so we were able to claim the money back. If this hadn’t been the case, we would have had to decide between paying huge money for treatment that we couldn’t afford or risking Natalia’s health. Medical bills aren’t the only reason to get insurance. Theft is an issue for travellers everywhere and certain insurance packages will cover stolen belongings in your policy. Tourists are seen as an easy target due to having high value items, so be sure to exercise caution throughout your trip and don’t showcase valuables unnecessarily. We met a number of people who fell victim to theft in South America so having yourself covered in this scenario can definitely pay off. While things won’t go wrong on every trip, insurance is a small price to pay for peace of mind. World Nomads offer different packages depending on how comprehensive you want your insurance to be. Click here to get a quote from World Nomads in a matter of seconds – that way you’ll know everything is taken care of if worst comes to worst! Regardless of whether you have insurance, there are some precautions you can take to minimise the impact of theft. We recommend avoiding carrying large sums of money around and instead leaving it in a secure place in your accommodation. You should also have at least 2 debit/credit/travel cards, and only take 1 out with you. That way if one is stolen, you have a backup and aren’t stuck somewhere with no money. It’s also important to have a backup of your pictures in case your camera/laptop is stolen. We always back up our pictures on pCloud – a cloud storage website. That way even if everything we own is stolen, we’ll still have all the pictures we’ve uploaded there and can access them anywhere in the world! For just a few dollars a month you can have 500 GB of storage which should more than cover pictures from all your trips. There are even lifetime plans available, offering either 500 GB or 2 TB of cloud storage for a one off payment! Click here to check out the cloud storage plans available with pCloud. One of the best things to know before travelling to South America is the local language, as it can make a huge difference to your trip. The majority of countries in the continent are Spanish-speaking, and even learning the basics can prove invaluable. Even if you’re not fluent, you’ll still be able to have meaningful interactions with locals – who are often very eager to learn about your travels. With some luck they may even let you in on a few of the local secrets. Locals know their homes better than any guidebook ever can, so they’ll have the best recommendations for where to go, what restaurants to visit and more! A great way to learn some Spanish for your trip is with the free app Duolingo. It’s an easy and fun way to learn a new language straight from your phone, and if you know some Spanish it will give you the opportunity to interact with more locals on your trip. Even if you don’t plan to travel long term in South America, it’s still worth learning the language anyway! Once a week, a number of South American cities close off main roads to cars – leaving pedestrians and cyclists to roam freely. Originating in Bogota, Colombia, cyclovia has a lively, party atmosphere, which creates a celebratory feel about it. With an abundance of live music performances and dancing in the streets, it’s certainly a spirited way to start your Sunday. In Colombia, it’s even common to stumble across guinea pig races – where bets are placed by passers by guessing which hut the animals will run into. While the quirks may vary between cities, the principle remains the same. Despite being a straightforward idea, the simplicity of it adds to the charm. Can you imagine London closing off Oxford Street once a week? It just wouldn’t happen, yet for some cities it’s the norm. 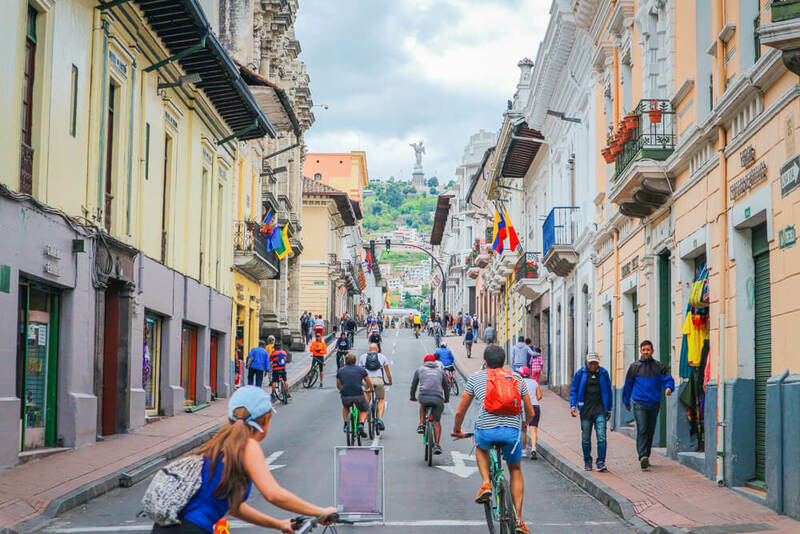 It’s well worth making sure your route for travelling South America coincides with cyclovia in at least one city! Brazil – Rio de Janeiro as well as other major cities. Colombia –Bogota, Cali and Medellin. Surprisingly, Facebook is home to some of the best tips for travelling South America. There are a number of groups on the site, run by the travelling community, offering consistently reliable information about travel in South America. From these groups you can find information that is nowhere else online – proving what an invaluable resource Facebook can be. You can save hours of research simply by asking a question in one of these groups. As some groups have over 30,000 members, more often than not someone is able to help. There’s also the added advantage of the information being WAY more up to date than guidebooks. Planning our trip to Machu Picchu, we became aware of strikes affecting tourists getting to the site. Fortunately we were able to get up to date information from these groups – which in turn helped us to successfully plan our visit. Without these groups, we would have had no idea strikes were even taking place, but luckily we planned our trip accordingly. These groups are also a great way to meet other travellers in South America if you’re travelling alone. Travellers often post to see if anyone in the same location wants to meet up for a drink or join in with a tour, which makes it perfect if you’re looking for some people to tag along with. Travel guides will never tell you all you need to know. In particular, travel guides covering South America as a whole will lack depth. This means lesser known, yet equally amazing places will be missed out entirely. To ensure you fill your trip with incredible experiences, do your research in advance of arriving to each place. It’s truly amazing what you can find. 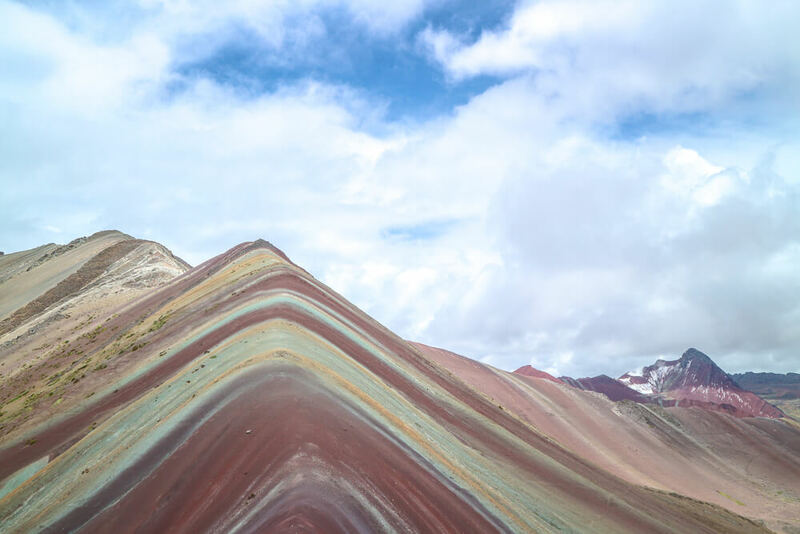 If we had simply followed our guidebook, we never would have visited the breath-taking Rainbow Mountain in Peru. 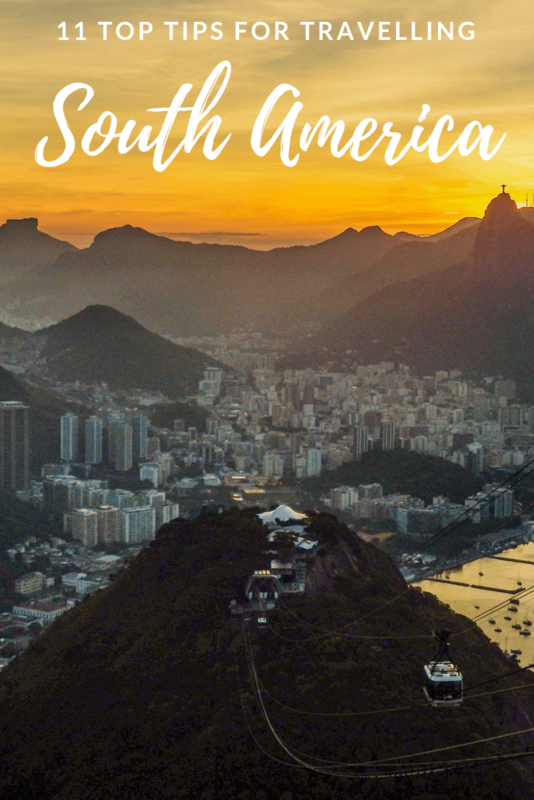 In 7 months of travelling South America, this stands out as one of our highlights – yet a guidebook with over 1,100 pages didn’t even mention it! While some guides will have good tips for travelling South America, other sources of information are far more valuable. We recommend asking other travellers for recommendations, searching pinterest, reading South America travel blog posts or joining Facebook groups. All will have information of value to you and give you some great ideas of what to do on your trip! 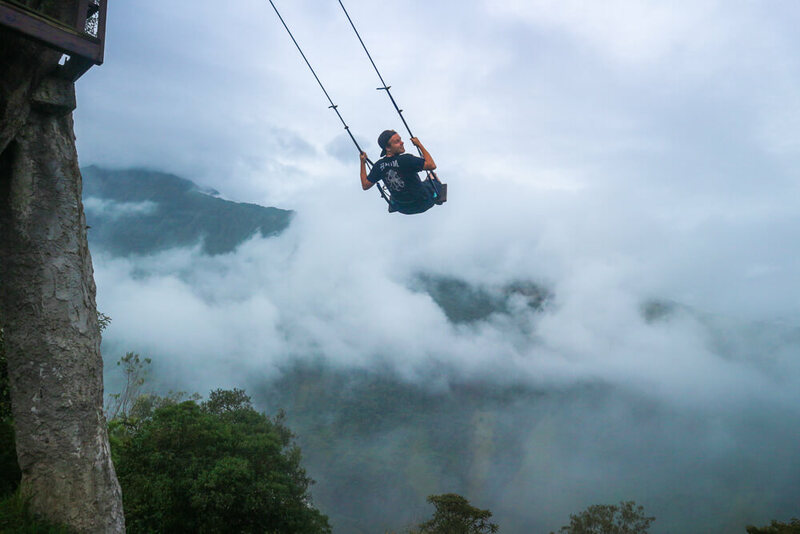 Another great option is to check out our Peru itinerary and Colombia itinerary, as these posts give our best advice of the places to visit and things to do when in these South American countries. One of the best tips for travelling in South America, or anywhere for that matter, is to never book the first tour you see. Itineraries and cost can vary significantly between operators so it’s best to look around. Equally, avoid booking tours through your hotel or hostel unless you’ve already compared prices elsewhere. While some have good intentions and offer competitive rates, others will lie and say they offer the best rate, when in reality you can find substantially cheaper prices elsewhere. 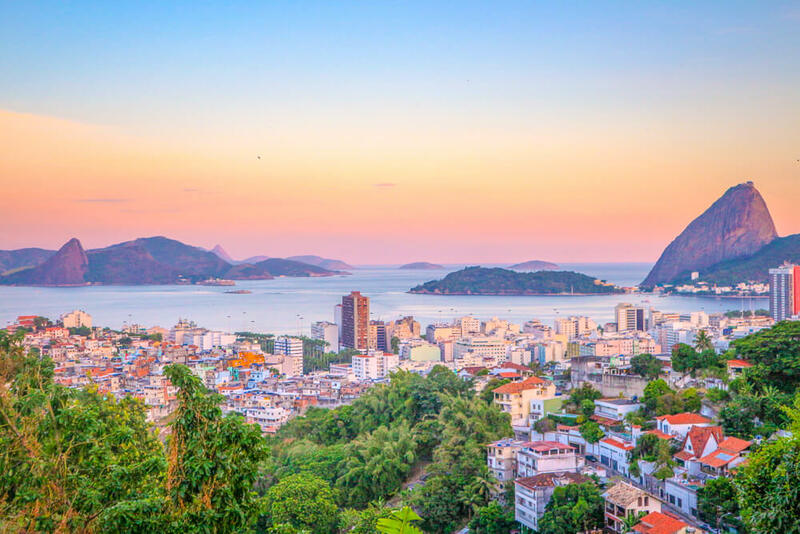 There are normally plenty of tour agencies around offering a variety of South America tours for backpackers, and due to the nature of their business they normally speak at least a little bit of English. This makes things a lot easier. As a reminder, it’s always best to research companies before booking through them. If the majority of reviews are negative, you should look elsewhere. Finally, be sure to negotiate a price – especially if you’re in a group. Most companies will be willing to give some form of discount for booking with them, so you don’t have to simply accept the advertised price. If you want to avoid crowds or save money, visiting countries out of peak season can be a great option. That way you avoid the sinking feeling of arriving to attractions only to find yourself crammed amongst hundreds of other tourists. With some luck you’ll also be able to negotiate yourself a better deal for something extraordinary like a Galapagos tour, or one of the many treks to Machu Picchu. You’ll also have the added bonus of a wider choice of accommodation, and generally cheaper prices. Peak season may vary depending on the specific area of the country you’re visiting – so do your research in advance. It’s also worth checking that the weather will not influence your trip if you’re visiting out of season. For some attractions – like Machu Picchu – we wouldn’t recommend going completely out of season. We visited in December, and for the majority of the day our view of the ruins was obstructed by mist. For something that’s likely a once in a lifetime experience, don’t leave anything to chance if you don’t have to. If you’re travelling for an extended period of time, withdrawing money from an ATM is inevitable. 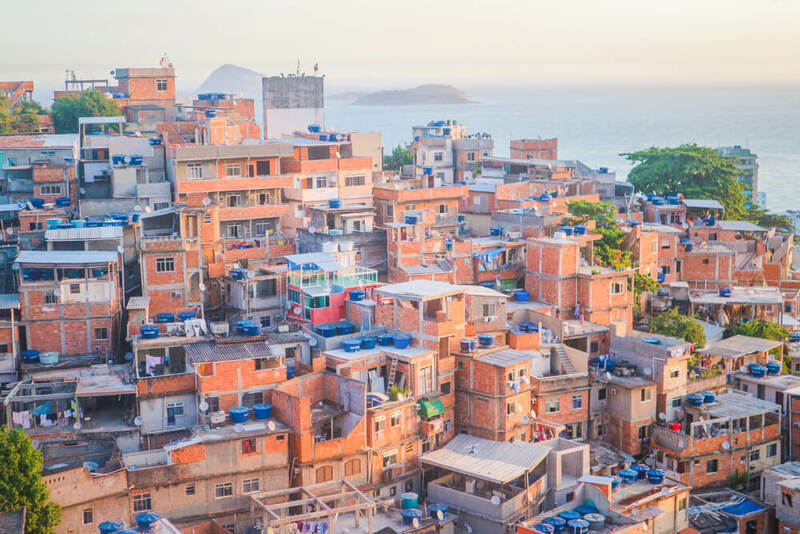 Even with the best travel cards (we recommend Revolut) you’re still likely to incur ATM fees as most South American banks have withdrawal fees. To minimise the impact of these fees, do your research in advance regarding which bank’s ATMs allow you to withdraw the greatest amount of money. Also research the fees charged by the ATM. That way you can be sure you’re not overpaying each time you withdraw. You should also make sure to withdraw the maximum possible each time – unless you’re 100% sure you won’t need that much. Even if you end up with leftover currency you can usually exchange it at land borders for a decent rate. When doing this check the exchange rate between currencies earlier in the day, to ensure you don’t get ripped off. A great piece of travel advice for South America is to always research visas before entering a country. Depending on which passport you hold you may have to pay more for a visa. For example, US itizens have to pay $160 USD for a tourist visa in Bolivia whereas British citizens can get a free 30 day visa. It’s well worth checking out visa costs before finalising your travel routes through South America. You should also be aware that certain countries charge extra accommodation taxes depending on the length of your stay in the country. 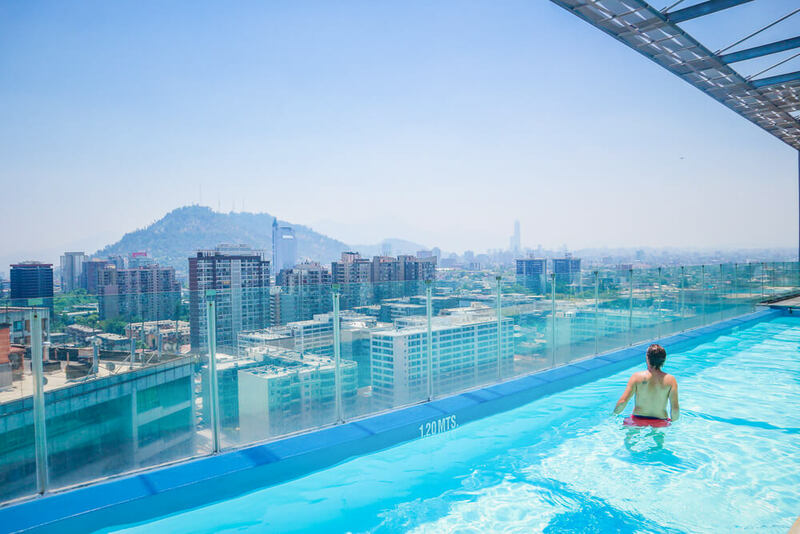 In Peru and Chile accommodations may charge around 20% extra on the cost of your stay if you have been in the country longer than 59 days. In Argentina you may be asked to pay 21% tax unless you pay via bank transfer, or a foreign debit/credit card. You may also be able to avoid these charges in some countries by paying in US dollars – as was the case for us in Chile. If you’re ever unsure what taxes you are expected to pay, you should double check with your accommodation. Sometimes this will be listed in the fine print of websites. It’s also worth noting that not all accommodations do seem to follow through with charging these taxes. That being said, it’s best to expect to pay them as otherwise it will come as a nasty surprise! If you’re a Wi-Fi addict, prepare for serious withdrawal symptoms! While it is possible to find a decent connection, more often than not that won’t be the case. Unfortunately, there seems to be no logic to finding a reliable connection either. Our main advice would be to read recent reviews of accommodation, as people will often say if the Wi-Fi works well. Sadly, not even this method works every time. On a number of occasions we arrived to Internet that barely worked – despite a number of reviews saying it was the best they’d had throughout their travels in South America. Another common issue to expect is the Wi-Fi is often limited to a small portion of the accommodation. Frustratingly, the signal never seems to cover all the rooms. Instead, you’ll most likely have to use common areas when you want a connection – which is a great excuse to be social! Fortunately, the continent more than makes up for the unreliable Wi-Fi situation and shouldn’t be a real concern. You’ll always be able to find somewhere to send a message home if need be. In some countries you’ll find that restaurants offer a special menu of the day option. This generally means a 3-course meal for a reasonably cheap price – depending on the standard of restaurant you’re dining at. More often than not you’ll have a few choices, but if nothing takes your fancy there’s always plenty of restaurants offering Menu del dia, so just try your luck elsewhere. We found the best value to be in Colombia, Ecuador and Peru, but unfortunately not all countries are as cheap. Meals in Argentina, Brazil and Chile were significantly more expensive, and so eating out regularly will drain your budget. For better value, we recommend cooking meals yourself and eating out less regularly in these countries. Alternatively, in Brazil some restaurants offered meals for 2 at considerably better value than individual meals. If you’re travelling South America on a budget, then this is one of the easiest ways to save cash! Like these tips for travelling South America? Pin them! Great tips. We are hoping a trip to South America is in our very near future. I will save this for sure! Thank you! We hope you have a great trip to South America, its an amazing continent! Such a great and thorough article. 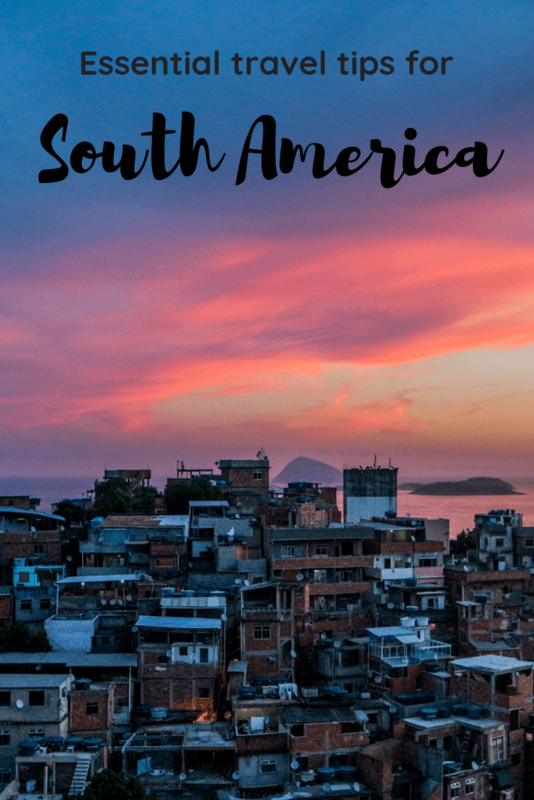 South America is one of my favorite places to travel but I wish I’d have had this article years ago! I definitely paid too much to access my own money in Costa Rica. And had quite the adventure trying to get a Bolivian visa in the airport. Thanks! We’re sure many people have made the same mistakes. It really is a beautiful place to travel, and now you know all the tips and tricks it’s a great excuse to go back!